Every Fall & Winter I start the season with many promises. I promise to wear more colour and hats, I promise not to let the cool and chilly nights stand in the way of fashion. So this past weekend I decided to finally wear a wannabe cropped sweater that I got last year and pair it with skinny jeans and boots. The night was beautiful and had all the qualities of fall yet still kind enough to allow me to keep my promise. My current full-time job is my Fashion Journal & working from home, I find my self missing the act of dressing up. Although I worked in an office before, we never had a dress code so I am always promising my self that for my next office job, I will wear more pencil skirts, try out new looks and always stay true to not matching! Every spring I go through my closet in preparation for summer and promise myself to wear the endless looks that I come across and love. I find my self in the same situation every year… Nearing the end of summer, half of my wardrobe untouched and wishing I had fulfilled my promises. 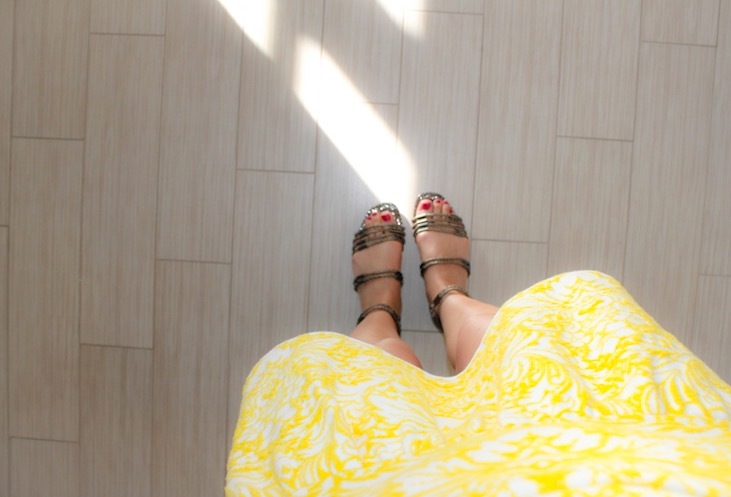 This dress is everything that is summer. Bright, cheerful, flowy and flirty. It is a reminder of how beautiful summer is.